On Nyepi day, which is New Year’s day in the Balinese Saka Calendar, the island of Bali turns off all lights and sounds, stops all traffic, deserts all worldly activities, and meditates, while complete silence and serenity reigns over the entire island. This year, Nyepi falls on Saturday, 17th March 2018,the exact same day that a large swathe of Indonesia from South Sumatra to Kalimantan, Sulawesi on to the Moluccas in eastern Indonesia will be passed by the rare event of a complete solar eclipse watched by thousands of domestic and international visitors, who come here for the purpose to best observe this planetary event. Therefore, travelers planning to fly to or from Bali on or around this date please note: On this day, the entire island of Bali will come to a complete standstill, - or American TV would say: is in “lock down” mode - to allow all to follow the prescribed rituals. Bali’s Ngurah Rai International Airport will be closed. No planes will land or take off for 24 hours. All traffic across Bali will be stopped. All shops are closed. No pedestrian traffic is allowed on the beach or on the streets. There will be local watchmen known as pecalang to ascertain that this rule is strictly obeyed. At night, all lights will have to be turned off. Hotels will close all curtains so that no ray of light shines to the outside. All sound and music indoors should be held to its lowest volume. On the eve of Nyepi, on 16th March, however, celebrations are held with large papier-mache giants, called Ogoh-Ogoh, paraded on the beach accompanied by loud gamelan music. These are then torched and, it is believed, that with the conflagration, any evil spirits that have brought disease and misery to the island during the past year will have also been banished. Every culture and religion in the world has its own way to define and celebrate the coming of the New Year. While the Chinese celebrate with drums and cymbals, the Muslims celebrate the first of Muharram, and the world in general celebrates the first of January with fireworks and parties, the Hindus of Bali welcome the New Year with the ritual of Nyepi. For, contrary to other cultures that celebrate New Year with vivacious and loud festivities, the pinnacle of Balinese New Year is a day of complete Silence. Hence the name Nyepi, meaning “to keep silent” in the local language, which falls on the day following the dark moon of the spring equinox. Nyepi is a day fully dedicated to connect oneself more closely with God (Hyang Widi Wasa) through prayers and at the same time as a day of self-introspection to decide on values, such as humanity, love, patience, kindness, and others, that should be kept forever. The series of rituals in conjunction with Nyepi, meanwhile, will take place from 3-4 days beforehand with the ritual of Melasti (also called Melis or Mekiis). The ritual is performed at the Pura (Balinese temple) near the sea (Pura Segara) which is meant to purify effigies, Pratima, and Pralingga (sacred objects) belonging to the temples, and acquire sacred water from the sea. 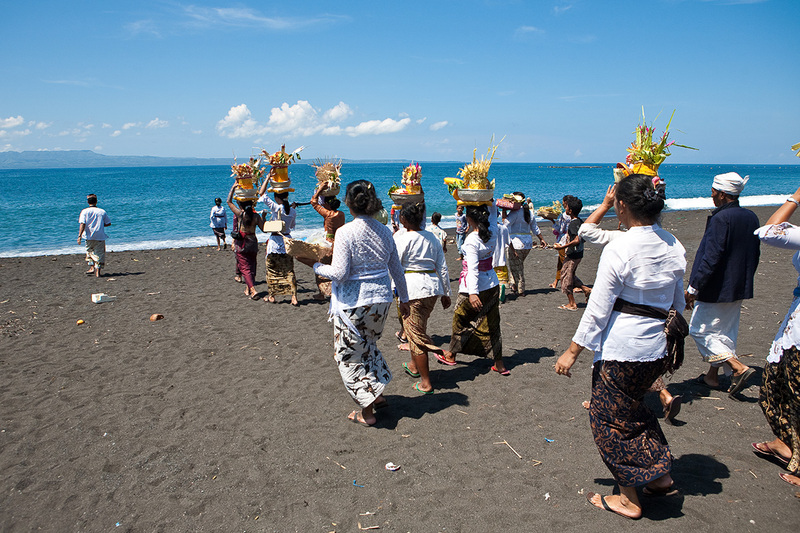 On Java, meanwhile, a similar ceremony is performed at the Balekambang Beach on the southern coast of Malang, East Java, in the ritual known as Jalani Dhipuja, and at the beautiful Prambanan Temple in the province of Yogyakarta. One day before Nyepi, on 16th march, the ritual of Tawur Kesanga and Caru will take place which are sacrificial rituals. Offerings are made at villages, districts, regencies and provinces in the form of chicken, ducks, pigs, goats, even cows or bulls. Plants and crops may also be used as offering. Aside from reminding the Balinese on the importance of their livestock and crops, the ritual is also meant to appease Batara Kala through the Pecaruan offering. At sunset at around 5 or 6 pm the ritual of Pengrupukan will take place. This is when the Balinese parade along the streets of their village by holding fire torches and vigorously play the kulkul (traditional bamboo bells). 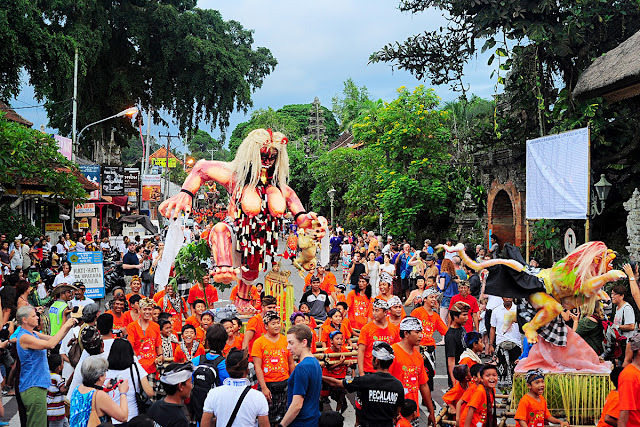 The parade will also be followed by a procession of Ogoh-ogoh, which are distinct Balinese giant paper puppets. The Ogoh-ogoh effigies depict the character of Bhuta or the evil spirit. After the procession, the Ogoh-ogoh will all be torched in a joyous conflagration in the main ritual known as Ngrupuk. The torching of the ogoh-ogoh symbolizes the cleansing of all evil influences in life. Amati Geni: Prohibiting the lighting of fires, the use of lighting or satisfying pleasurable human appetites. Amati Karya: Prohibiting all forms of physical work other than those dedicated to spiritual cleansing and renewal. Amati Lelungan: Prohibiting movement or travel; requiring people to stay within their homes. Amati Lelangunan: Prohibiting all forms of entertainment, recreations or general merrymaking. The day after Nyepi, which this year falls on 18th March 2018, is called Ngembak Geni. This is when Balinese Hindus visit families, neighbours and relatives to exchange forgiveness – somewhat similar to the Muslim’s Ied Al Fitri custom in Indonesia. They will also conduct the Dharma Canthi by reciting Sloka, Kekidung, and other religious scriptures. Although the series of rituals takes place virtually over the entire island, the best time to watch the festivities is on the eve of Nyepi when people parade the ogoh-ogoh along the streets. The large effigies will then be burnt on the beach.